One of the most important skills to teach your child when it comes to reading and writing is summarizing. This will help not only with writing skills but monitoring understanding of a text. Being able to summarize what they’ve read in their own words can show that your child comprehends what they read. Writing a nonfiction summary can be challenging for some children at first. Many tend to retell the entirety of what they have read. Regurgitating information is not summarizing, however. This method for writing a nonfiction summary will help your child improve their reading and writing skills. Topic sentences should give the overall idea of what the passage, chapter, article, or book is about. Generating a topic sentence is very simple if you introduce a few easy steps. First, have your child identify the content (i.e. Chapter 1, The article, “Birds of Prey”, or Who Was Harriet Tubman?). Next, have them use an action verb in the sentence that focuses on explanation of the text (i.e. shows, explains, tells). Finally, state the main idea by finishing up the sentence with an overall thought (i.e. the history of Mesopotamia, different birds and their food sources, or a Civil War hero’s mission to help slaves escape to freedom. Who Was Harriet Tubman? explains a Civil War hero’s mission to help slaves escape to freedom. All of the detail sentences in the summary paragraph should support the main idea. The reader should be able to identify the main idea of the paragraph if they read the supporting detail sentences independent of the topic sentence. In the topic sentence mentioned above, the details may look like this. Harriet Tubman escaped from slavery on her own. She earned the nickname Moses because she led people to freedom. Tubman helped slaves escape through the Underground Railroad. The Underground Railroad wasn’t an actual train but a network of people that helped slaves throughout the country.These detail sentences are added after the topic sentence to formulate a summary paragraph.Add a closing sentence.In a summary, a closing sentence can be a way to restate the topic sentence (i.e. This biography about Harriet Tubman focuses on the way she helped slaves reach their freedom during the Civil War). Closing sentences may also be used to state an opinion or make a comment regarding the text (i.e. Harriet Tubman was very brave to face danger while she helped slaves escape to their freedom). Have your child put all the steps together to write a formal, well-written paragraph. Eventually, steps 1-3 will become automatic, and they will write the sentences into a well-structured paragraph as they go. 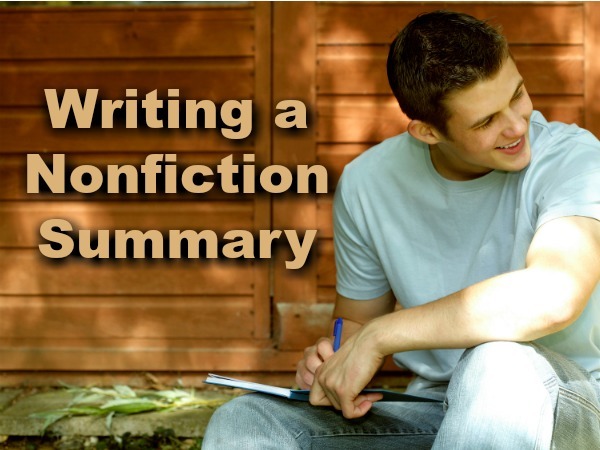 Writing a nonfiction summary can be a simple task for your child with these three easy steps. Start with a topic sentence, follow with 4-5 detail sentences, and wrap up the paragraph with a closing sentence. This method is adapted from the Step Up to Writing method for writing summaries.